Storing and transporting irradiated fuel rods has been the subject of much discussion and misinformation. Part of the problem is the vocabulary that is commonly used when discussing this thorny problem. This is an attempt to clarify the current process at Indian Point as high-level radioactive waste is moved from fuel pools to on-site storage. A combination of a stainless-steel canister holding fuel assemblies and the concrete over pack is what we have been referring to as dry cask storage. 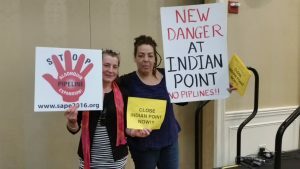 We have been told that transport casks are being used at Indian Point. Actually, it is the stainless-steel canisters that are capable of being transported, not the concrete over packs. Here is a look at that process in detail based on a conversation with Neil Sheehan, Public Affairs Officer for Region One and NRC staff. The draft of this document was subsequently vetted by all those involved in the conversation. This report was written to reflect information put forward by the NRC and does not reflect the views or opinions of the author. The Indian Point nuclear power plant is located on approximately 239 acres. The existing Independent Spent Fuel Storage Installation (ISFSI) is approximately 96 feet by 208 feet, and has a maximum capacity of 75 casks. It is the understanding of the NRC that a second ISFSI pad will be constructed adjacent to the current pad. Because the plant would need about 130 casks total to hold all of the spent fuel remaining from plant operations, the second pad would likely be similar in size. This is a small footprint relative to the size of the site. The starting point for this discussion is the fuel assemblies in the fuel pool. The number of years rods spend in the fuel pool is variable. Five is the number generally quoted; however, individual sites can make their own decisions even though they must wait for the minimum amount of time specified in their license. VT Yankee loaded canisters after 3 years because of improvements in over pack technology and after receiving NRC approval. NRC staff states that there is new guidance coming out soon on high burn-up fuel. For purposes of storage they find no difference between high burn-up and regular fuel. NRC staff has found that high burn-up fuel has the structural integrity to take stress as well as regular fuel, should it be moved. There are NUREG reports about this and a summary of the regulations will be released in the spring of 2018. 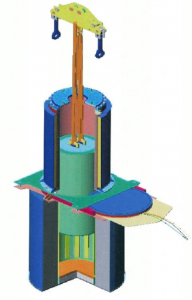 32 fuel assemblies at a time are loaded into each stainless-steel multipurpose canister (MPC). This is done underwater in the fuel pool where 40 feet of water acts as a radiation shield. The canister which is then dried, filled with helium to facilitate heat transfer, and welded shut, is then ready to be placed inside a transfer cask. It is then placed on top of the storage over pack that has been brought into the building. The transfer cask provides for radiation shielding as the MPC is moved from the pool and into the concrete storage over pack. The transfer cask bottom hatch is opened and the MPC is lowered inside the concrete storage over pack. A transporter moves the over pack containing the MPC slowly to the storage pad. The stainless steel MPC is always inside a transfer cask when it is being moved into and out of an over pack, and the MPC is always placed in an over pack as a shield from radiation to protect workers during storage on site. It may later go from the storage over pack to a transport over pack. See the diagrams at the end of this report for further clarification. Radiological contamination is not considered a problem in this process. There will eventually be 100 + over packs with fuel assemblies in storage at Indian Point. Information on how much space this will take is forth coming. The estimate will assume that all over packs are stored up right on a concrete pad. The NRC has done analysis of radiation on the degradation of materials (like embrittlement) and will release a report in the spring of 2018. Their analysis looked at the effects of radiation exposure for 100 years and found that radiation levels are well below levels that would be expected to degrade the metals that make up the MPC, transfer cask, and the transport over pack. The transport over pack will provide adequate protection for the driver and any vehicles encountered along the way. Changing over packs or canisters because of defects was not discussed. Once on the pad in a Holtec Hi-STORM 100 storage over pack ambient air moves from the bottom of the over pack through channels and exits the top taking heat with it. Hi-STORM air vents are checked to make sure that they are clear. Temperature differences between ambient air and the air released at the top of the over pack is monitored. There is dosimetry monitoring around the perimeter of the pad. The NRC claims 30 years of practice with this system. They will not physically monitor the site but will make inspection visits to check the records maintained by the company that is responsible for doing so. The company that owns the reactor license can apply for permission to the NRC to sell all or part of the property at any time. The property being sold must meet the NRC radiological criteria which is a person living on the site, eating food grown there and drinking the water must not be exposed to more than an additional 25 millirems annually. The owner of the operating reactor license may also sell the license to a company specializing in decommissioning with NRC approval. The NRC will hold a hearing to determine the fiscal viability of the company and their ability to handle any technical or degradation problems over the years. The plant’s original operating license is granted for 40 years. 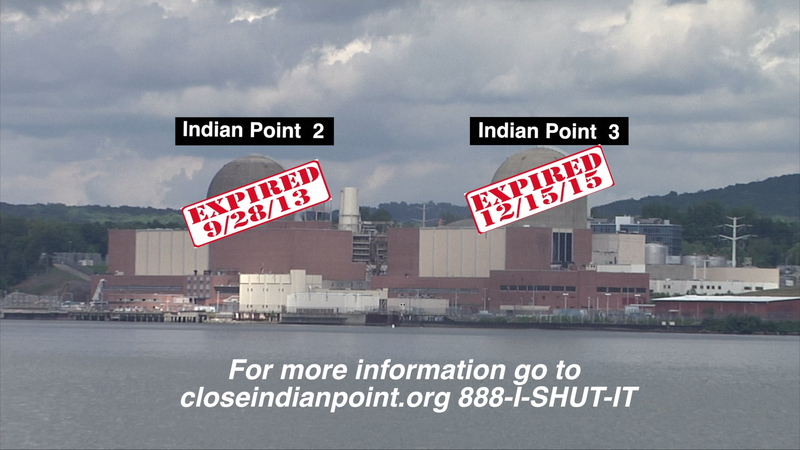 Indian Point’s license was up for renewal for an additional 20 years, but Entergy has agreed to cease operations of both units as of 2020 and 2021. Their license however goes to 2025.
if the spent fuel pool had been removed. 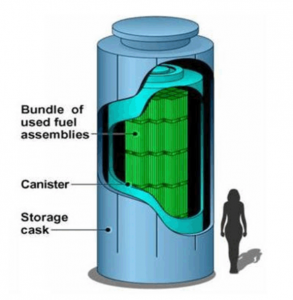 Should a centralized or interim storage be established to receive this high-level radioactive waste, a transfer cask would be inserted on top of the over pack as it sat on the pad. The over pack would be unsealed and the canister lifted into the transfer cask. The transfer cask would then be moved on top of the HI-STAR transport over pack and the MPC would be lowered into it. The Holtec Hi-STAR transport cask would then be sealed. 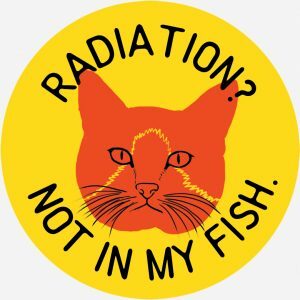 The amount of radiation exposure to workers during this process would be expected to be well below regulatory exposure limits. The new transport cask would provide protection for the driver and other vehicles along the way to centralized storage. The route of the vehicle would be carefully planned to avoid traffic concerns and it would be escorted. (Note: this is different what we have been told in the past and not what the plan for Indian Point calls for.) The transfer process for transport outlined here has not been done at any decommissioned civilian reactor. The Holtec Hi-STAR transport cask has been produced and it is in limited use in a storage capacity at two sites. Neither the MPC nor the transfer cask would be contaminated during this transfer process as the MPC would be tightly welded in place. On February 23, 2018 I spoke with NRC Public Affairs Officer Neil Sheehan and other staff. This is a report on our conversation which was vetted by all parties and not a reflection of my own views or opinions. Q. 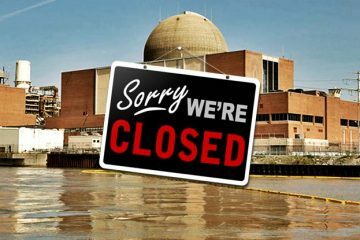 What is the order for the removal of spent fuel pool from U.S. nuclear power plants? A. The order in which the U.S. Department of Energy (DOE) was originally supposed to accept spent fuel for pick-up from nuclear power plants was based on oldest fuel first. However, it would be good to check with DOE on this as the plan may have evolved over time. In addition, there has been draft legislation that mentions the sequence of removal. For our part, the NRC’s mission is to ensure the material is stored and transported safely and securely. Q. At what point would DOE take ownership of the spent fuel? Is it when the fuel physically leaves the property bound for a permanent or interim spent fuel repository? This is another question best posed to DOE. The NRC would have an oversight/inspection role in the movement of spent fuel, including the licensing of storage casks and transportation packages, but the details of when the plant owner transfers title of the fuel to another entity – most notably DOE — will be something the DOE and the plant owner will have to work out. Are the dry casks being used at Indian Point transportable? The Indian Point has used Holtec systems for its dry cask storage. There are certified transportation packages available to transport those storage canisters. For example, the HI-STAR 100 has been approved for this purpose by the NRC. The plant owner is responsible to ensure they can meet all the conditions in the transportation certificate of compliance. The Indian Point nuclear power plant is located on approximately 239 acres. The existing Independent Spent Fuel Storage Installation (ISFSI) is approximately 96 feet by 208 feet, and has a maximum capacity of 75 casks. It is our understanding that a second ISFSI pad would be constructed adjacent to the current pad. Because the plant would need about 130 casks total to hold all of the spent fuel remaining from plant operations, the second pad would likely be similar in size. Again, this is a small footprint relative to the size of the site.